A children's musical fantasy with some creepy elements, The 5,000 Fingers Of Dr. T preys on every child's mistrust of the domineering piano teacher, but only partially succeeds as entertainment. In a typical suburban home, Bart Collins (Tommy Rettig) is about 10 years old, and struggling to cope with the practice, practice, practice demands of his pompous piano teacher Dr. Terwilliker (Hans Conried). Bart believes that his widowed mother Heloise (Mary Healy) has fallen under Terwilliker's spell. The local neighbourhood plumber August Zabladowski (Peter Lind Hayes) appears to be a decent man, but unwilling to intervene and save Bart. Bart dozes off at the piano and has a nightmare. He is held prisoner at the surreal Terwilliker Institute, where Dr. T intends to gather 500 children to play continuously on a massive piano. Heloise is Dr. T's main assistant, and kept under control by his hypnotic powers. Zabladowski is the institute's plumber, but is initially reluctant to help Bart and his mom to escape. With an army of henchmen chasing after Bart at every turn, he has to find a way to end Dr. T's evil plot. 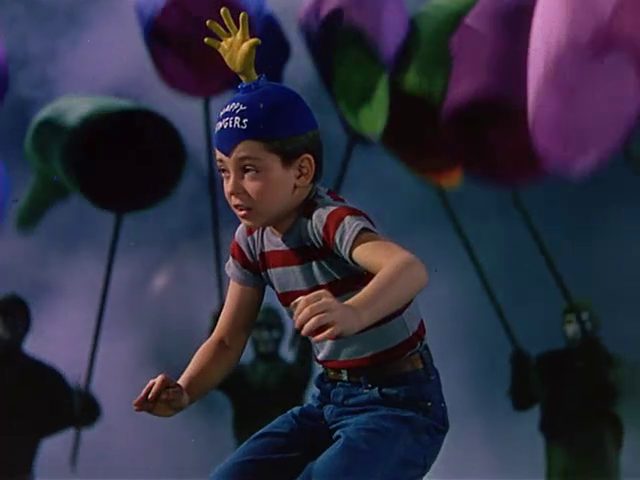 Conceived and written by Dr. Seuss, directed by Roy Rowland and produced by none other than Stanley Kramer, Dr. T was a seemingly ambitious project that floundered on the rocks of production difficulties, limited talent and less than impressive musical numbers. Seuss' first script apparently ran to 1,200 pages, and in a ruthless editing job, close to a dozen songs were cut to try and create a cohesive 90 minute narrative. The main set design is an impressive achievement: colourful, curvy and instantly recognizable as a creation from Seuss' imagination, filled with sinewy staircases, ladders to nowhere, signs pointing to the obvious, secret dungeons and subterranean chambers. The costumes are equally bright and flashy. And while there are a few scary moments (the operator of the dungeon elevator can instigate nightmares for years among the young), the film mostly rides a vibe of candy-coloured adventure, as young Bart never displays fear, just a determination to break out of his imprisonment. But the film suffers from a distinctive sparsity. Just the four main characters get meaningful speaking parts, with the rest of the cast made up of indistinct extras. The song and dance numbers are sometimes painfully bland, and with no stars to liven up the show, they tend to just wither in place. There is also a missed opportunity to make use of the mammoth piano, the centrepiece set never put to use as the film rushes to chaotic climax. In addition to affirming children's animosity towards practicing the piano, there are some adult themes at play. The World War Two metaphor is the most obvious, with Terwilliker at Hitler, Heloise representing those under his spell, and Zabladowski as the US initially reluctant to get involved. The film also touches on 1950s paranoia of the atom bomb, as Bart ends up disrupting Dr. T's plans with a dangerously unstable scientific device. More of a quirky curiosity than an outright success, The 5,000 Fingers Of Dr. T is packed with idea fragments, but can never quite assemble the right tune.